Gate28 Launches No-win No-fee Airline Compensation Claim Service in Spain | Marbella Marbella – Adelante! On the 1st of August 2015 Gate28 launched Spain’s first dedicated no-win no-fee flight delay compensation claim company, giving Spanish air passengers affected by delays, cancellations or denied boarding the means to claim up to 600€ per person. The company provides a bridge between legislation and compensation; ensuring passengers know their rights under EU Regulation 261 / 2004 and fighting on their behalf (in court if necessary) to make the airlines pay up. Gate28’s arrival is both welcome and timely, as flights to and from Spain currently experience the highest number of cancellations and delays in Europe, and the majority of Spanish travellers are unaware of their rights. Gate28 is based in Barcelona and powered by EUClaim, one of Europe’s largest companies in the airline compensation industry. This gives Gate28 access to EUClaim’s rapid online compensation calculator that can instantly tell delayed passengers if they are eligible to claim and how much money they can expect to receive in compensation from the airlines. Airlines often refuse individual claims by stating ‘extraordinary circumstances’, safe in the knowledge that passengers don’t have the relevant data, know-how or finances to follow through. Whereas, Gate28 has access to EUClaim’s enormous database containing literally millions of flight and weather stats which can be used to force the airlines to meet their obligation to pay up. Gate28’s Founder Willem van der Hooft explains, “We chose Spain as a starting point because the EU regulation is largely unknown and it is the country with the highest number of delayed and cancelled flights. Incredibly, only 5.4% of air passengers in Spain know their rights under EU Regulation 261/2004 or bother to claim compensations. 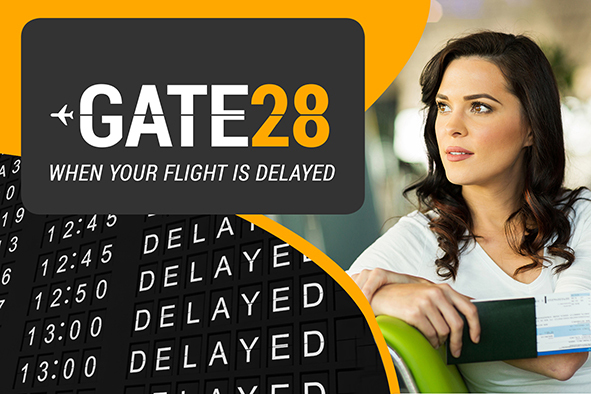 “Gate28’s mission is to make sure that airline passengers know they are legally entitled to receive compensation from the airlines for delay, cancellations and if they are denied boarding. Secondly, we want to give everyone access to financially risk free yet effective claims service. “Individual passenger claims are often rejected by the airlines. However, when Gate28 presents a claim on a passenger’s behalf the airlines take notice. This is because our affiliation to EUClaim gives us access to their legal and analytical expertise allowing us to push claims through to a successful conclusion in 97% of all cases. What’s more, we bear all legal costs including court cases and we’ll only receive commission after a client’s case has been won”, concluded Mr van der Hooft.